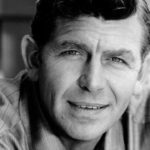 Andy Griffith was an American actor, comedian, television producer, Southern gospel singer, and writer. He was a Tony Award nominee for two roles, and gained prominence in the starring role in director Elia Kazan’s film A Face in the Crowd (1957) before he became better known for his television roles, playing the lead roles of Andy Taylor in the sitcom The Andy Griffith Show (1960–1968) and Ben Matlock in the legal drama Matlock (1986–1995). "I was baptized alongside my mother when I was 8 years old. Since then, I have tried to walk a Christian life. And now that I’m getting older, I realized that I’m walking even closer with my God." "Mornin’ ladies, my goodness don’t you look happy. Must be cuttin’ somebody up pretty good."